The Indianapolis Motor Speedway Museum quietly celebrated its 60th anniversary this year. It opened early in 1956 in a wing of the Speedway’s administration building with a single race car on display, fulfilling a dream of the late Tony Hulman who, early in his ownership tenure, announced his intention to do just that. After the museum’s collection grew well beyond the capacity of that first home, its present facility opened in 1976. A vision for the museum’s future has been struck: “Motor racing will be a revered aspect of our American heritage and a valued part of family culture for generations to come.” As the three-year strategic plan to implement this vision unfolds, I discussed the state of things with Betsy Smith, executive director of the non-profit Indianapolis Motor Speedway Foundation that operates the museum, and the museum’s director, Ellen Bireley, a 25-year veteran of IMS. “Our mission here is to celebrate more than a century of the innovation, thrill, and adventure of motor racing at the Speedway,” exclaimed Smith, who said other types of racing, such as Le Mans and F1, will continue to be recognized. The strategic plan has as its basis a need for more exhibit, education, and program space and a greater use of technology to tell those stories about the drivers, the cars, and the Speedway that it is not equipped to do today. A major goal is to educate the casual visitor who may not know IndyCar racing from NASCAR. “We’re not doing as good a job as we can and should be doing,” Smith noted. And this is where technology comes in. For example, on a touchscreen, imagine an electronic image of the Borg-Warner Trophy on which visitors can touch the image of a winning driver and pull up information about him and his victory, including a video clip. In terms of more space, the possibility of a major facility expansion is at the heart of a study by an architectural/engineering firm. Some preliminary drawings have been presented to the museum’s nineperson, highly engaged, and supportive board. “Tens of millions of dollars,” Smith said, will be needed to more than double the museum’s 97,000 square feet of space, allowing for greater display areas, consolidation of storage and other facilities, and perhaps locating the restoration shop inside the museum. A preliminary drawing depicts striking modern architecture that could greet visitors. Attendance has been “maintained” over recent years at about 130,000 annually, with 83 countries represented. Giving people a more enriching experience could increase that number. How to pay for all this? Presently, the museum is funded by museum admissions, track and grounds tours, facility rentals, a small number of sponsorships, and support from IMS and the Hulman-George family (the gift shops in the building are not the museum’s). Museum memberships are available for the first time (see website), but major funding would have to come from the “philanthropic community,” said Smith, who is experienced in not-for-profit fund-raising. Advertising and promotion of the museum are being studied. 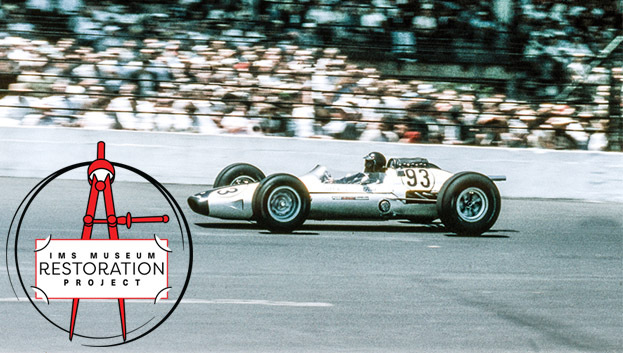 The museum has its first website, indyracingmuseum.org, and even a Twitter account. Another means of promotion is loaning museum cars to automotive-related events. “If we take a car out to a show, it would draw attention and then people would want to come and see more of our collection,” according to Bireley.